everything works except the water does not pump out of the collection tub at the bottom. it just stopped emptying one day but you can still hear the pump churning away. i cannot pull the unit it out because the installed tile floor prevents it. i have tried removing the lower spray bar for access under the cover into the area water food is chopped up and pumped out but cannot find how to get in there. i cannot pull the unit it out because the installed tile floor prevents it. That will be an issue!! everything works except the water does not pump out of the collection tub at the bottom. This is an forward/reversing style d/w....so the motor runs in one direction to wash,stops and the motor runs in the other direction to drain. On the forward/reversing style of dishwashers that won't drain, make sure the motor is reversing to drain the water out. If the motor does not reverse to drain, the motor, wires ( especially where the doors bends to open and close ) and timer will have to be checked. 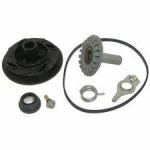 If the motor is reversing and running, the pump impellor inside the motor and pump assembly may be damaged and is incapable of pushing the water out to drain. The tail pipe piece that connects the drain hose from your d/w to the house drain is also another popular place to get a clog. Check the drain check valve ( screws into the pump body ) for any restrictions. For most or all of these the lower access panals will need to be removed or the d/w pulled out.